device to lift, transfer, or increase the pressure of a fluid (gas or liquid) or to create a vacuum in an enclosed space by the removal of a gas (see vacuum pumps under vacuum). ..... Click the link for more information. and the piston-equipped compressor used to inflate tires to machines that use a rotating, bladed element to achieve compression. The four basic types of compressors are reciprocating, rotary screw, centrifugal, and axial-flow. These are further classified by the number of compression stages, the cooling method (air, water, or oil), the drive method (e.g., engine, motor, steam, gasoline, or diesel), and lubrication. air whose volume has been decreased by the application of pressure. Air is compressed by various devices, including the simple hand pump and the reciprocating, rotary, centrifugal, and axial-flow compressors. ..... Click the link for more information. . Air under compression can be stored in closed cylinders to provide an continuous or as-needed supply of pressurized air. a device for compressing air or another gas and supplying it under pressure. The pressure ratio in a compressor is more than 3. Blast blowers are used for delivering air with a pressure increase of less than 2–3 times, and ventilators are used at heads of 10 kilonewtons per sq m (kN/m2), or 1,000 mm H2O. Compressors, which came into use in the mid-19th century, were first built in Russia in the early 20th century. The principles of the theory of centrifugal machines were set forth by L. Euler, and the theory of axial compressors and ventilators originated from the work of N. E. Zhukovskii and S. A. Chaplygin. Compressors are classified according to their principle of operation and basic design features (reciprocating, rotary, centrifugal, axial-flow, and ejector-type), the type of compressed gas (air, oxygen, and so on), the pressure pn created (low pressure, 0.3–1.0 MN/m2; medium pressure, up to 10 MN/m2; high pressure, above 10 MN/m2), and capacity (the volume Vc of gas taken in or compressed per unit time, usually in m3/min). Compressors are also characterized by the speed of rotation n and power consumption N.
A reciprocating compressor consists of a cylinder and piston; it also has inlet and delivery valves, which are usually located in the cylinder head. 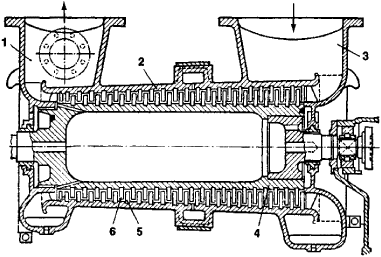 Most reciprocating compressors have a crank and connecting-rod assembly with a crankshaft for imparting reciprocating motion to the piston. Reciprocating compressors may be of the single-cylinder and multicylinder types, with vertical, horizontal, V-shaped, or W-shaped cylinder arrangement, single or double action (in which the piston operates on both sides), and single-stage or multistage compression. The operation of a single-stage reciprocating air compressor is as follows (see Figure 1): upon rotation of the crankshaft, the connecting rod imparts backward motion to the piston. 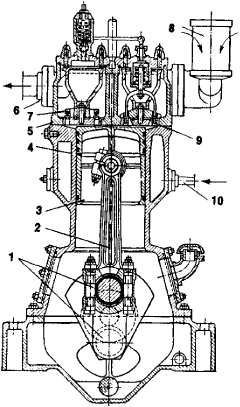 Simultaneously, rarefaction develops in the cylinder because of the increased volume between the piston head and the cylinder head, and atmospheric air, overcoming through its own pressure the resistance of the spring retaining the inlet valve, opens the valve and enters the cylinder through the air intake and filter. 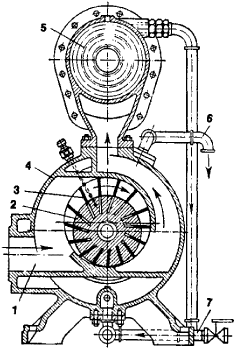 During the reverse piston stroke the air will be compressed, and then, when its pressure exceeds the pressure in the discharge nozzle by an amount sufficient to overcome the resistance of the spring holding the delivery valve to the seat, the air opens the delivery valve and enters the piping. When a gas is compressed in the compressor, its temperature is increased considerably. To prevent spontaneous combustion of the lubricant, the compressor is equipped with water cooling (with a pipe for water supply) or air cooling. In this way, the air compression process will approximate an isothermal process (with constant temperature), which is theoretically most advantageous. The single-stage compressor, based on safety conditions and the economy of its operation, is best suited for use with a pressure ratio under compression of β = 7–8. Multistage compressors, which make possible the generation of extremely high gas pressures (above 10 MN/m2) by alternating the compression with intermittent cooling, are used for greater compression. Reciprocating compressors are usually equipped with automatic capacity control that depends on the flow rate of the compressed gas to maintain a constant pressure in the pressure piping. Several control methods exist; the simplest of them is regulation of changes in the rate of shaft rotation. spaces bounded by the vanes, as well as the surfaces of the rotor and cylinder casing, will increase in the left half of the compressor, thus causing the inlet of gas through the aperture. In the right half of the compressor the volume of the spaces decreases and the gas within them is compressed and then delivered from the compressor to the cooler or directly into the pressure piping. The casing of rotary compressors is cooled by water, which is supplied and discharged through pipes. The pressure ratio in a single stage of the rotary vane-type compressor is usually 3–6. Two-stage rotary vane-type compressors with intermittent gas cooling provide pressures up to 1.5 MN/m2. The principles of operation of rotary and reciprocating compressors are basically similar; they differ only in that all processes in the reciprocating compressor take place in the same place (the cylinder) but at a different time (hence the necessity of providing valves), whereas in the rotary compressor inlet and delivery occur simultaneously but in different places, separated by the rotor vanes. Other types of rotary-compressor designs are known, including screw compressors, which have two rotors in the form of screw propellers. Rotary liquid-piston vacuum pumps are used for the removal of air to create rarefaction in a space. The capacity of a rotary compressor is usually regulated by changing the frequency of rotation of the rotor. impeller, where it is compressed and acquires velocity. The compression continues in the annular diffuser because of decrease in velocity of the gas (the transformation of kinetic energy into potential energy). After this, the gas enters another stage of the compressor along a return guide channel. The creation of high gas pressure ratios in one stage (more than 25–30 and, in industrial compressors, 8–12) is limited mainly by the ultimate strength of the impellers, which make possible tip speeds as high as 280–500 m/sec. An important feature of centrifugal and axial compressors is the ratio of the pressure of the compressed gas, power consumption, and the efficiency to the capacity (output) of the compressor. The nature of these ratios for each type of compressor, as plotted on graphs, is called the performance characteristics. The operation of centrifugal compressors is controlled by various methods, including changing the speed of rotation of the rotor and throttling the gas on the inlet side. and a row of stator blades. During operation of the compressor, the rotating rotor blades exert a force on the gas particles between the blades, forcing them to be compressed and to move parallel to the compressor axis (hence the name “axial-flow compressor”) and to rotate. The network of fixed stator blades mainly provides the change in the direction of the gas particles’ velocity required for efficient operation of the next stage. In some types of axial-flow compressors an additional pressure increase also occurs between the stator blades as a result of a decrease in the velocity of the gas. The pressure ratio for a single stage of an axial-flow compressor is usually 1.2–1.3 (that is, it is considerably lower than that of centrifugal compressors), but the axial-flow type has the highest efficiency of all types of compressors. The ratio of pressure, power consumption, and efficiency to capacity for certain constant speeds of rotation of the rotor at the same temperature of the gas being compressed is represented in the form of performance characteristics. Axial-flow compressors are controlled in the same manner as centrifugal compressors. 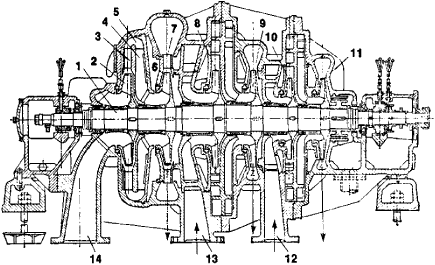 Axial-flow compressors are used in gas-turbine installations. The technical efficiency of axial-flow compressors, as well as the rotary, centrifugal, and reciprocating types, is evaluated according to their mechanical efficiency and certain relative parameters that indicate the extent to which the actual gas compression process approaches the theoretically most desirable process under given conditons. Ejector-type compressors are similar in design and principle of operation to jet pumps. They include ejectors for the inlet or delivery of gas or a vapor-gas mixture. Such compressors provide a higher compression ratio than jet pumps. Water vapor is often used as the working medium. The main compressor types, along with their characteristics and uses, are shown in Table 1. Sherstiuk, A. N. Kompressory. Moscow-Leningrad, 1959. Ris, V. F. Tsentrobezhnye kompressornye mashiny, 2nd ed. Moscow-Leningrad, 1964. Frenkel’, M. I. Porshnevye kompressory, 3rd ed. Leningrad, 1969. Tsentrobezhnye kompressornye mashiny. Moscow, 1969. A routine or program that reduces the number of binary digits needed to represent data or information. The part of a compandor that is used to compress the intensity range of signals at the transmitting or recording end of a circuit. A machine used for increasing the pressure of a gas or vapor. Also known as compression machine. A machine that increases the pressure of a gas or vapor (typically air), or mixture of gases and vapors. The pressure of the fluid is increased by reducing the fluid specific volume during passage of the fluid through the compressor. When compared with centrifugal or axial-flow fans on the basis of discharge pressure, compressors are generally classed as high-pressure and fans as low-pressure machines. Compressor displacement is the volume displaced by the compressing element per unit of time and is usually expressed in cubic feet per minute (cfm). Where the fluid being compressed flows in series through more than one separate compressing element (as a cylinder), the displacement of the compressor equals that of the first element. Compressor capacity is the actual quantity of fluid compressed and delivered, expressed in cubic feet per minute at the conditions of total temperature, total pressure, and composition prevailing at the compressor inlet. The capacity is always expressed in terms of air or gas at intake (ambient) conditions rather than in terms of arbitrarily selected standard conditions. Air compressors often have their displacement and capacity expressed in terms of free air. Free air is air at atmospheric conditions at any specific location. Since the altitude, barometer, and temperature may vary from one location to another, this term does not mean air under uniform or standard conditions. Standard air is at 68°F (20°C), 14.7 lb/in.2 (101.3 kilopascals absolute pressure), and a relative humidity of 36%. Gas industries usually consider 60°F (15.6°C) air as standard. Compressors can be classified as reciprocating, rotary, jet, centrifugal, or axial-flow, depending on the mechanical means used to produce compression of the fluid, or as positive-displacement or dynamic-type, depending on how the mechanical elements act on the fluid to be compressed. Positive-displacement compressors confine successive volumes of fluid within a closed space in which the pressure of the fluid is increased as the volume of the closed space is decreased. Dynamic-type compressors use rotating vanes or impellers to impart velocity and pressure to the fluid. A machine for compressing air or other gases which is a basic component in some refrigeration systems; draws vaporized refrigerant from the evaporator at a relatively low pressure, compresses it, and then discharges it to a condenser. Two types of compressors used in aero-engines. A rotor that draws air into the engine and is driven by a turbine. A compressor must provide the required pressure rise; the compression must be affected with the least possible loss; it must be aerodynamically stable over the operating range of RPM; and the tip speed must not approach too close to sonic speed. The two types of compressors are axial flow and centrifugal flow. (1) A device that diminishes the range between the strongest and weakest transmission signals. See compandor. (2) A routine or program that compresses data. See data compression. Existing compressor mass flow rate and power at given operating conditions are used to construct metamodels for compressor performance. VSD electric motors generate pulsating torques; even if the pulsating torques are extremely small with respect to the main torque, they can excite compressor train resonances with potential shaft or couplings damages. Compressor product briefs usually focus on top line statistics like specific power consumption, cost and refrigerant application. Compressed air is needed for most plastics processing, but compressors are usually "hidden away" in the plant room and are not seen as a potential area to reduce costs. LG intends to reduce greenhouse gases emitted over the lifetime of its products by 30 megatons by 2020, from raw materials, components such as linear compressors, logistics, product use and disposal. The turbulence caused by off design incidence angles in some components as well as local flow separation may cause broad spectrum noise in the shaft vibration signature; that is, the overall compressor vibration levels will increase, but there is no distinct frequency. CompAir collects this real time information and can advise companies on their complete compressed air usage and make recommendations for a compressor configuration to most efficiently meet these needs. Up to now, all chillers using the Turbocor compressor have been water cooled. MHI holds a near 25% share of the global compressor market in the petrochemical and oil refining fields. The main advantage of this over single-stage units is that two different sized compressors can be connected in series so that an optimized map is available for each flow-rate range. Once these measures were implemented, the compressor discharge pressure was reduced from 120 psig to 100 psig, lowering the system pressure to 95 +/- 5 psig. For example, a fixed-speed compressor running with modulation control still consumes about 70% of full-load electrical power, which translates into substantial electrical costs with no benefit.